What’s New – David Leech, Inc.
Last summer we offered our clients some extra help with their to-do list of house and yard projects, and we’re happy to report the response was great! We built decks, repaired fences, replaced windows, installed grab bars and assisted with a variety of other tasks. Since we enjoyed the experience so much, we’ve decided to extend our offer again this summer, which will run through the end of August. And once again, we’ll be thanking our wonderful clients by offering a discount on each and every project. Have you been compiling a to-do list of projects throughout the year? Can we help you clear some items from your list? We don’t consider any project too big or too small, and we’ll come take a look at it free of charge. From fence, deck and porch repair to the installation of window AC units and small kitchen projects/repairs, we’re ready to assist with whatever we can. And we gladly accept payment by Visa, MasterCard and Discover. Please contact us at 503-234-1551 to schedule your free consultation, or send us an email at david@davidleechinc.com. Let’s get going on your list! 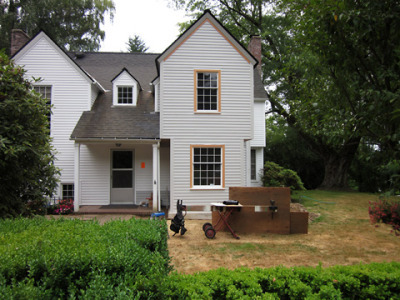 We noticed an article in the Saturday, October 18, 2014 Oregonian newspaper regarding incorporating “Aging in Place” ideas if you’re considering remodeling your home. “Aging in Place” is the current term used for being able to stay in our present homes for as long as possible by using products and services as our circumstances change. We can continue to live in the home of our choice safely and independently as we get older. There were some good suggestions offered in the article, so in case you missed it, we’ll share it with you here. “By 2030, almost 1 out of every 5 Americans—some 72 million people—will be 65 years or older, according to the US Department of Health and Human Services’ National Institute of Aging. If you’re considering a remodel, especially of a kitchen or bath, give some thought to your long-term future. Amanda Davis, whose students at Portland Community College earn a certificate in Design for Accessibility and Aging in Place, offers these five concepts involved in aging in place, also known as accessible design or Universal Design. There should be 36-inch wide doorways, wide hallways and wide staircases. This is especially important for first responders if there is an emergency. Also, if a lift is to be installed some day, stairs need to be at least 36 inches wide. Select furnishings with aging in place in mind: Chairs should have tall backs to hold onto and rugs need to be secured to the floor to prevent tripping. A well-laid-out kitchen is key. Storage and light switches need to be easy to access. Create a place to sit in the shower. Think of design this way: the environment should serve the users. Create shower walls that can accommodate grab bars. Reinforce walls along stairs for a lift one day. 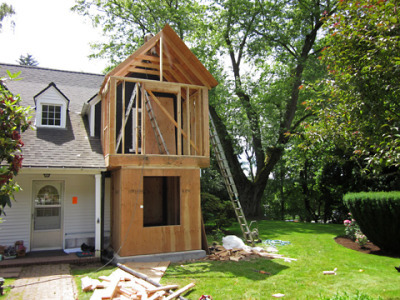 Design the framing of a home for an elevator in a multistory house. Design an environment to serve all abilities. Accessible design is part of the practice of sustainable design. Environments should be safe and inclusive, not hazardous and exclusive. 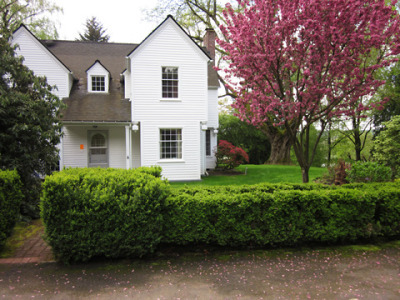 We recently completed an addition in a lovely older home in Milwaukie. All additions are unique, of course, and this one was no exception. Our clients wanted to install an elevator to allow wheelchair access from the ground floor of the home to the upper floor studio. As interior home space could not be sacrificed to accommodate the required elevator shaft, outside space was created to house the elevator. Custom windows and outside lighting within the shaft addition were chosen to give the impression of living space as the elevator moves up and down. The size of the addition was larger than normally required to house the elevator cab, which allowed extra space for ledges to be built where potted plants could be placed. 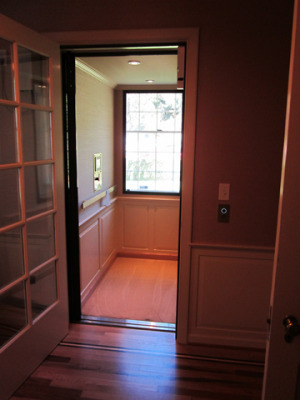 The elevator installation itself was done in partnership with one of Oregon’s leading residential accessibility dealers. The end result? Perfection!!! 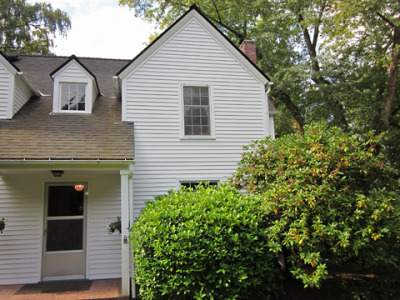 The home as it was before the elevator addition began. Interior space could not be sacrificed to accommodate the elevator shaft, so outside space was created. Exterior of the new addition at 90% complete. View from the upstairs studio, calling elevator up to ride down to study. 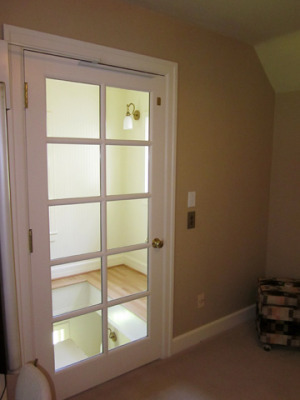 Door for the elevator cab is a standard residential door, which can be solid or can include glass. View from main floor study; elevator parked and ready to take up to studio. View of interior of cab. The largest cab option of 3′ x 6′ was chosen to accommodate a wheelchair and an attendant. 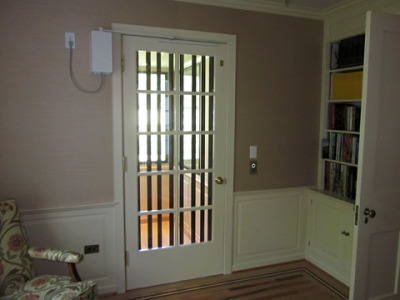 Custom interior of wood panel wainscoting and wallpaper was chosen. The window in the cab and window on the exterior of the addition were included for natural day lighting, which matches the same design used on the upper floor studio. 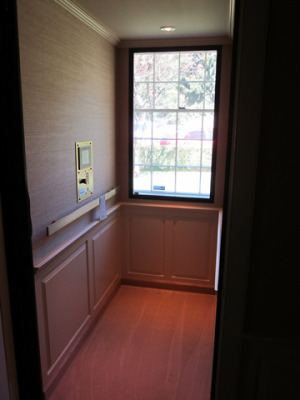 View looking into finished elevator from main floor study. Finished view of exterior elevator addition. 5. The FIR program is based on an hourly-rate structure, which allows the City to offer pre-application consults and after-hour inspections to be billed at their current customary hourly rate. 6. A well-managed project, from start to finish, will lower overall costs because we will avoid unnecessary inspector visits and limit the number of corrections and reinspections. It also will mean less time spent in the Development Services Center (hooray!) and will keep our projects on schedule. We’re very thankful to have been accepted into the FIR program and look forward to sharing this benefit with our deserving clients. Now as we go about building people’s dreams, we offer one more valuable service to make your experience with us the best one ever!